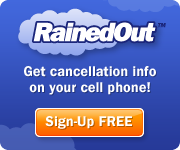 Mother Nature continues to follow the Engine Pro Sprints on Dirt presented by ARP as Showers & Thunderstorms throughout the morning and continuing into the afternoon with a forecast for more of the same in the evening have forced SOD & Baer Field Motorsports Park Officials to Postpone tonight’s events to tomorrow (Sunday, May 21st)…. The MAHLE/Clevite Beyond Limits Challenge Race #1 at Baer Field Motorsports Park in Fort Wayne, Indiana will go an hour earlier across the board with the revised Schedule of Events listed below. The Engine Pro Sprints on Dirt presented by ARP were scheduled to take on the newly reconfigured 3/8s (0.375) mile high-banked dirt oval of Hartford Speedway on Friday, May 19th. Unfortunately, Mother Nature would have a say as Rain Showers and a forecast for more of the same throughout the afternoon and into the evening have forced Series & Track Officials to postpone King Engine Bearings King of Michigan Race #1. Both Series & Track Officials are diligently working on a suitable makeup date for the track located west of Kalamazoo in Hartford, Michigan and when that is determined, it will be announced. SOD now shifts focus to the next event on the schedule on Saturday, May 20th, the MAHLE/Clevite Beyond Limits Challenge Race #1 at Baer Field Motorsports Park in Fort Wayne, Indiana. The last time SOD raced in the Summit City was back in 1994 during the days of the SOD Schedule consisting of both dirt and pavement facilities. Denny England went to victory lane back on September 10th, 1994. Engine Pro Sprints On Dirt presented by ARP racers and fans alike are experiencing excitement overload in anticipation of a history-making May 19th and 20th “May Mayhem” weekend. While SOD will be at two speedways it has raced at before, both races will be on new tracks. SOD returns to Hartford Speedway, a familiar venue for several years now. SOD also travels to Baer Field Motortsports Park in Fort Wayne Indiana, where SOD has raced before, but over 20 years ago during a few years when SOD ran pavement as well as dirt. On Friday, the King Engine Bearings King of Michigan Race #1 at Hartford Speedway will take place on the reconfigured 3/8 mile oval. Excitement is running high for Tim Dibble’s new track layout that is sure to challenge racers. It is configured very differently at each end making the optimal set up a compromise. On Saturday, SOD will make history with the first race to be held on the new Baer Field track. 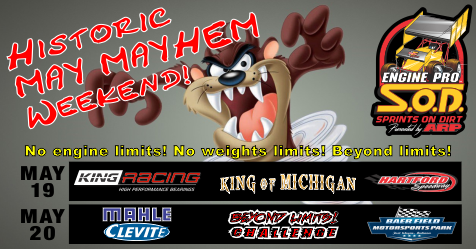 The MAHLE/Clevite Beyond Limits Challenge will kick off its 2017 series on the newly created ¼ mile oval inside the existing paved track. Promoter Dave Muzzillo is confident that the track layout will quickly become a big hit with race fans as exciting, close-quarters racing should be the norm. As an extra effort to make sure the inaugural race goes as planned, the next day, Sunday, May 21 has been set as a rain date. Visit the Hartford Speedway website at www.hartfordspeedway.net. Check out Baer Field at www.baerfieldmotorpark.com. For more information about Engine Pro go to www.enginepro.com. For more information about ARP, go to www.arp-bolts.com. The full 2017 Sprints on Dirt schedule, results, rules, current news, and other information are available at www.sprintsondirt.com. 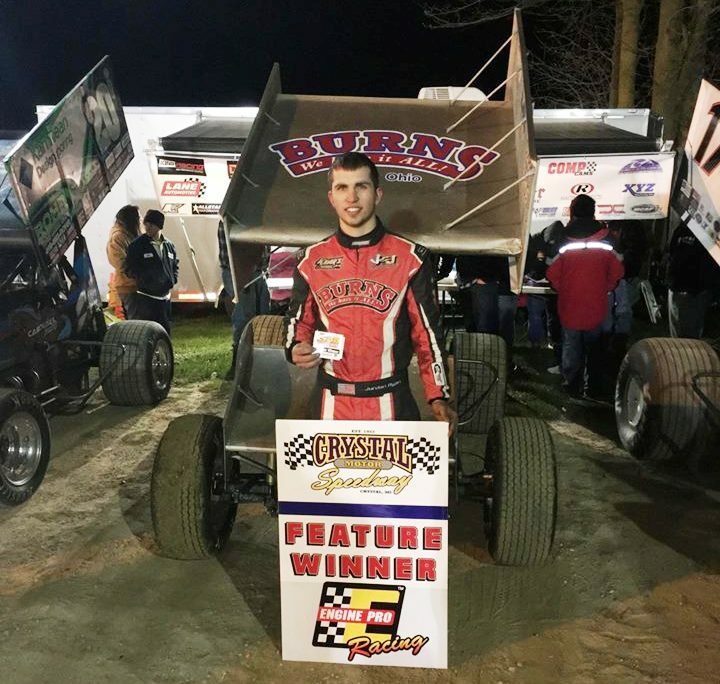 On a cold, windy Michigan night, the action was hot for the Engine Pro Sprints On Dirt presented by ARP season opener at Crystal Motor Speedway as Castalia, Ohio’s Jordan Ryan led green to checkered for the win. Ryan, in a 410, won over Matt Foos in a 305 normally driven by Kelsey Ivy. Foos stayed within striking distance of Ryan all race long, but never had a chance to challenge the leader. Dain Naida, started 5th and appeared to get better as the race went on, and took 3rd from Max Stambaugh at the finish. After a brief caution for a spin on lap 2, the next 23 laps went nonstop. SOD competitor Mark Aldrich started the night off in an exciting way doing a series of flips in turn four during qualifying. The damaged parts were quickly replaced, and Aldrich transferred to the feature through his heat race, but retired early, finishing in 19th place. Dain Naida came from 4th to win the Engler Machine & Tool heat. Max Stambaugh picked up the COMP Cams heat from the pole position. Matt Foos won the RockAuto.com heat from the pole also. Dan McCarron won the B Main with Sturat Brubaker, Andy Chehowski, Troy Chehowski, and Austin Nemire also advancing to the feature.